2017 FLHR Magnum Non-ABS Caliber 12" Handlebars w/Sterling Chromite II Installation Kit. Magnum Caliber Handlebar Kits. 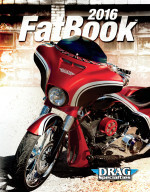 Bagger style for non-ABS Harley-Davidson® motorcycles. Magnum 1.25 Caliber handlebars are manufactured with the highest quality construction, including machined control mounts and feature high luster chrome finish for an unsurpassed appearance. All handlebars are 1 ¼” diameter, have 3 ½” on center knurling, work with standard controls, including hydraulic clutch, and are machined for internal wiring and electric throttle control. Kits include: Magnum 1.25 Caliber Handlebars, throttle and idle cables, a clutch cable or hydraulic clutch line, (except 08-16 Dressers models) brake lines, copper crush washers, hardware and wiring extensions. Note: Cable & line lengths are based on using 2” risers .